Idaho Gov. C.L. “Butch” Otter. BOISE, Idaho (AP) — Gov. C.L. 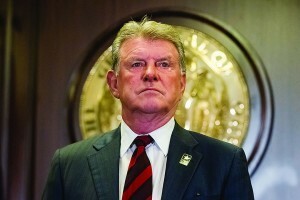 “Butch” Otter has vetoed his first pieces of legislation of sent to him by the Legislature. On Friday, Otter nixed a proposal requiring the state to offer state employee health insurance plans that utilize health savings accounts, or HSAs. Otter criticized the bill for having too many complications, arguing that it would lead to greater out-of-pocket costs for state employees who select a high-deductible health plan. However, the Republican governor encouraged lawmakers to study the idea after the legislative session is over. Otter also vetoed on Friday a proposal changing the requirements for the annual state survey of state employee pay and benefits.